It’s so easy and fun—kinda like a 7th grade science experiment. 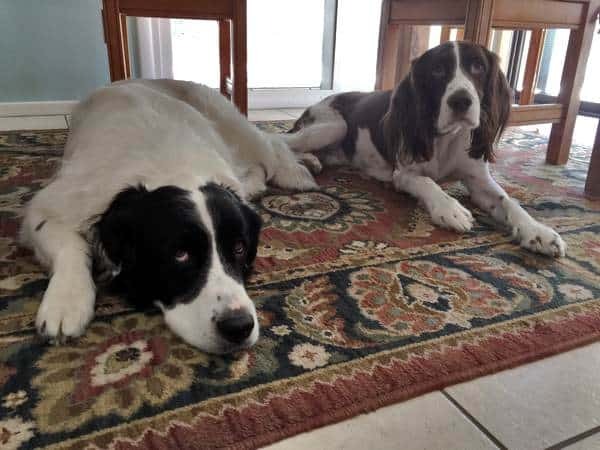 This all came about thanks to Bentley and Fenway—two rescue pups we adopted about a month ago. In an attempt to feed them better meals, I started adding canned pumpkin puree to their food. And needless to say they loved it! But it gets expensive—at least $1.99 for a 15-ounce can in my local markets. 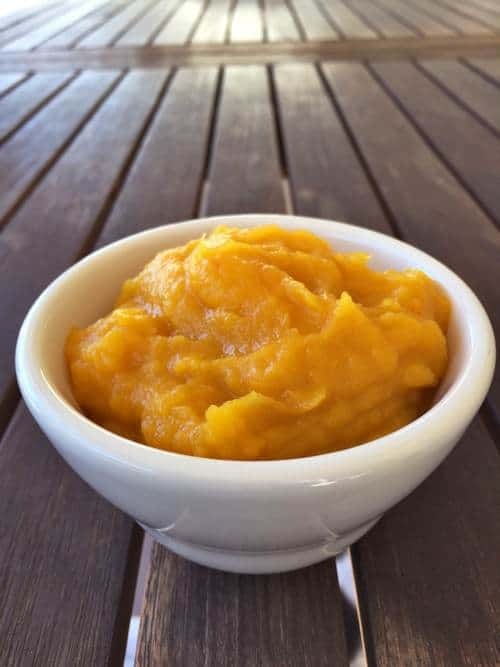 I haven’t tried this in the oven yet (it’s still too warm hot here in Phoenix to turn the oven on and heat up the whole kitchen), but fresh homemade Weight Watchers friendly pumpkin puree couldn’t be easier to make when using my electric multi-function pressure cooker… my new love! 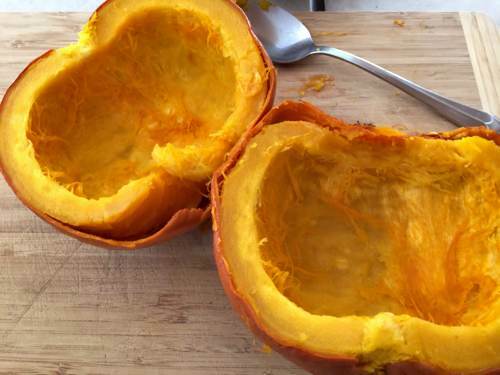 Cutting the pumpkin after it’s cooked couldn’t be easier. Scooping out the pumpkin guts and seeds can be a bit messy, but it’s also a little fun. For me, it usually feels like cooking is often about being careful and neat, so this is one of those times where you can just roll your sleeves up and be a little messy. After you’ve got all the pumpkin seeds and goop removed, you’ll find that the pumpkin almost literally peels away from the skin. Then just store in an airtight container in the fridge and use it however you want. I’m so looking forward to doing some fun baking with it this fall… can’t wait! If you have any easy dessert recipes using fresh homemade pumpkin puree, be sure to let us know in the comments below. 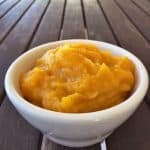 Easy and delicious homemade pumpkin puree made in your pressure cooker (InstantPot). This is so much better tasting than anything you'll get from a can! Add steamer rack to InstantPot Pressure cooker. Add 1 cup water to pressure cooker. 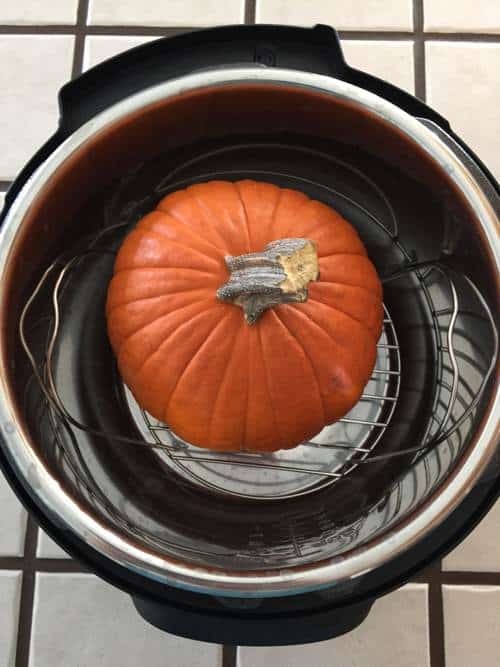 Place pumpkin on rack inside pressure cooker and make sure the lid seals. If the stem is too tall, trim stem until lid seals properly. Seal pressure cooker cover and cook on HIGH pressure for 13 minutes. 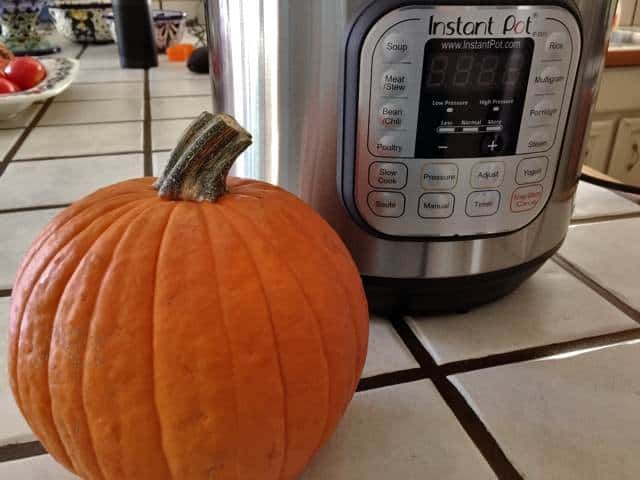 Your InstantPot pressure cooker will take some time to build up the pressure and temperature inside. 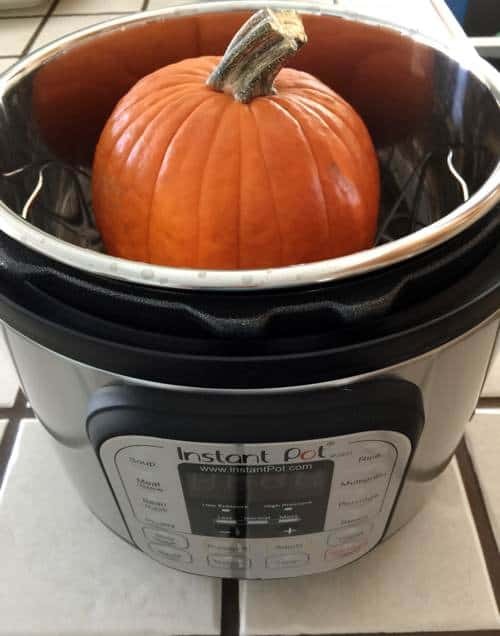 After the 13 minute cooking time finishes, allow your InstantPot to release the pressure naturally for at least 10 minutes. Then if you want to release it manually, go ahead. Or, just let it completely release on its own. 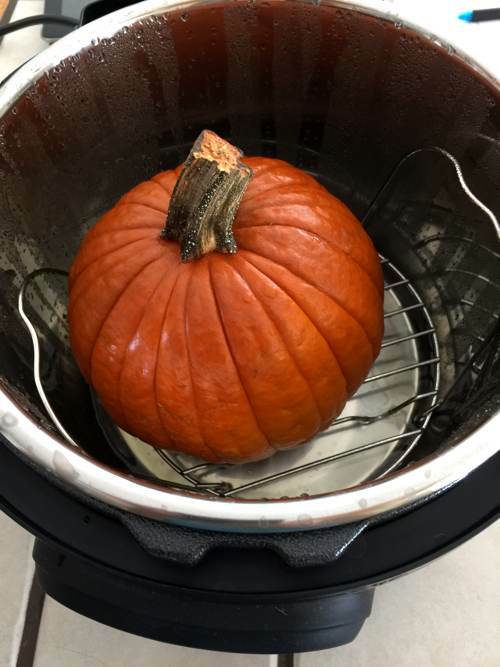 Once the pressure is released, remove the cover and carefully lift out the rack, being careful not to drop the pumpkin which will be very hot. 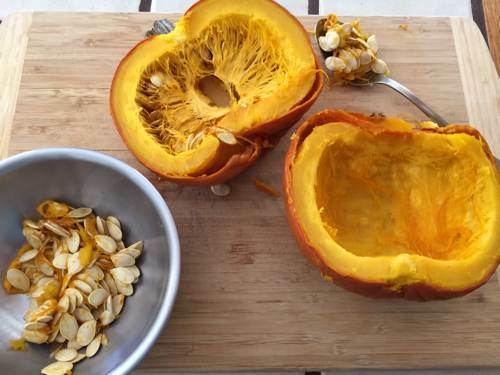 Place pumpkin on a cutting board and cut in half. 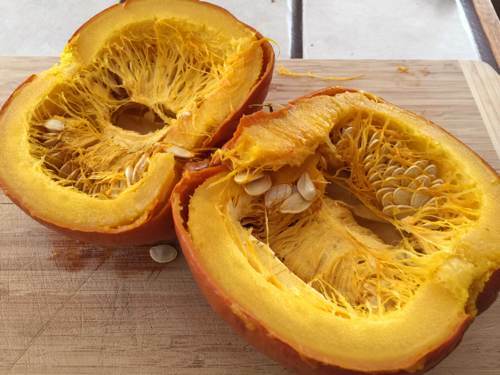 Scoop out seeds and pumpkin goop. Feel free to rinse and drain pumpkin seeds for later use. 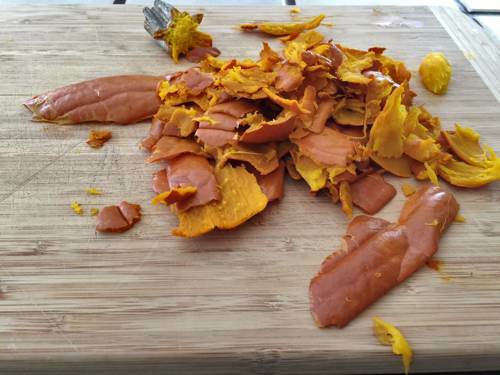 Peel cooked pumpkin from the skin and add to Vitamix or other high-powered blender or food processor. Process to desired consistency. Scoop out fresh pumpkin puree and store in airtight container in the refrigerator. My pumpkin gave me about 3 cups of pureed pumpkin. 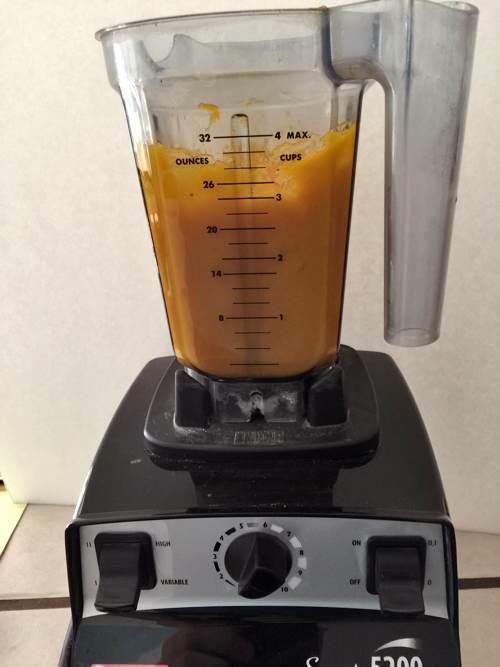 Amounts of puree will vary based on the size of pumpkin used. 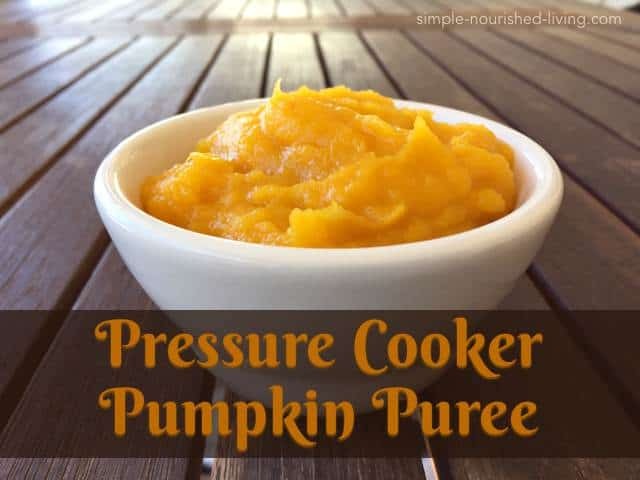 If I don’t have a pressure cooker how would I go about getting the puree done? What-else could I use or do with the pumpkin to get the puree? You could bake it or slow cook it like I did with this spaghetti squash. Have you tried it in pumpkin pie yet? I have a regular pressure cooker…wonder if directions would be the same?